Take Me Out To the Ball Game…..
We recently took Jacob for his first ever Major League Baseball game. Mike is an avid blue jays fan…I’m talking watches every game not a bandwagon fan! So of course we needed to head on over for a game this summer. We decided to take the train into the downtown core since it was Caribana weekend and the extra millions of people in our city just didn’t encourage us to drive. 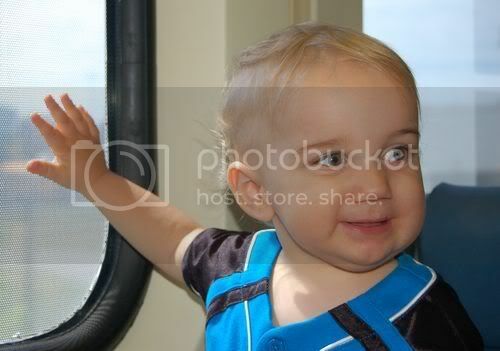 Of course Jacob was VERY interested in the train tracks and after many unsuccessful attempts to get to the tracks he sat his 14 month little self down on the concrete in protest – as if he was saying “listen folks, I’m not getting up from here until you let me on those tracks”. I’ll let you decide who won the battle on that one. Jacob LOVED the train – and when I say LOVED I mean…LOVED to the capacity that someone couldn’t love something anymore. As it approached the platform Jacob pointed and clapped and smiled in excitement and spent most of the trip on the train peering out the window pointing at things as we passed them. 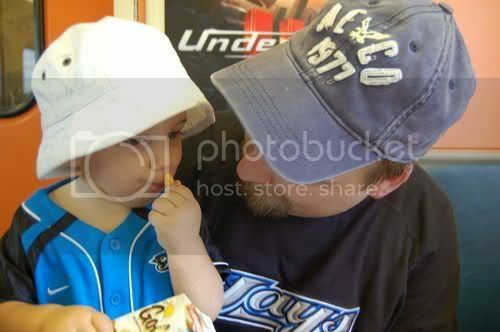 Of course no train ride could be complete without a hearty snack of goldfish crackers – Daddy and Jacob were not ashamed to indulge. Mommy passed! 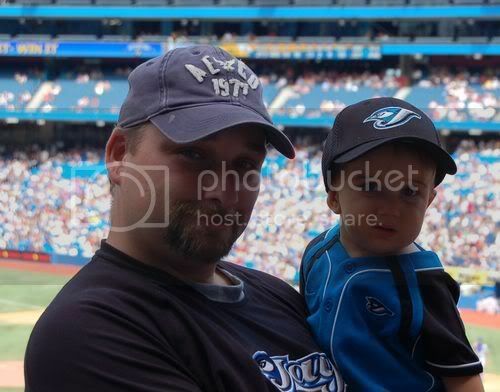 Jacob was decked out in his Nike Blue Jays romper that my mother had picked up for him when she heard we were going to the game – Mike of course bought him an official ball cap when we got to the game! I thought it looked pretty cute! He seemed unsually cranky at the ball game and at first I thought he just didn’t like the crowd and all the babies around us (it was babies at the ballpark day) but mid game he screeched and I just happened to look into his mouth and what did I find…but the corner of a new tooth peeking out next to his two bottom middle two. Figures….Jacob has to pop a tooth in style – he just couldnt’ do it at home in bed like most babies – he needed to pop that sucker out around a crowd of oh say 30, 000….ha! 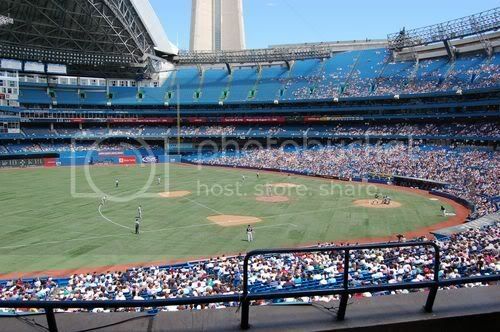 The Jays were playing the Texas Rangers and WON 4-1! 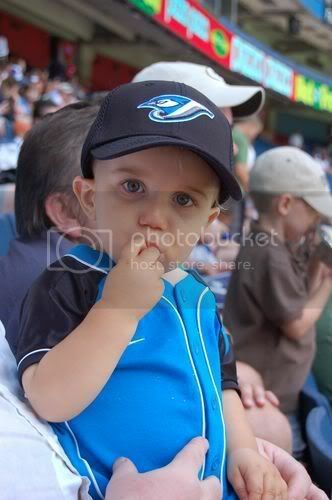 How exciting that the Jays would win at Jacob`s first game – Maybe he is their good luck charm or maybe they are just that good! I`m more inclined to go with the first option. Before heading home Daddy and Jacob needed the obligatory pose in front of the field so here it is for you all to see! On the way home of course Jacob needed to STOP and watch the trains pull into the train yard. 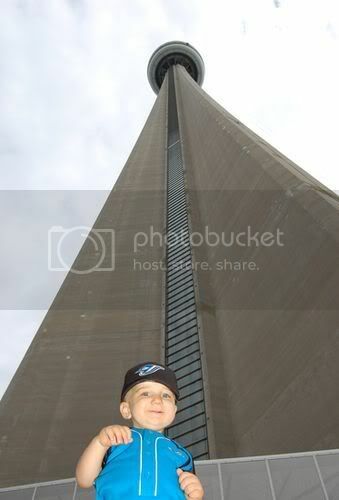 And lastly the CN tower as we passed by on route to the train station….